Ramsay Welding & Fabrication, Inc. was originally founded in 1968 by David Ramsay and operated as Ramsay Welding Research, Inc. The Company was sold and renamed Ramsay Welding & Fabrication, Inc. in order to portray its future direction and emphasis as a full scale metal fabrication shop. As time passed, it was decided to add CNC Milling and Turning services to better serve customers' needs. Brent Marks, the current owner and president had been with the founding company for over 10 years before purchasing it in 1988 from David Ramsay. The company has evolved from research and development of the forming and joining processes of new metal alloys and the development of equipment used in those processes, to a full service, state of the art metal fabrication shop. The shop can handle work of all sizes and materials, and has the largest variety of filler wire in house for use in many welding services. Our focus on quality and service has never waivered. In the past, Ramsay Welding Research, Inc. was the industry leader in the joining processes of new metal alloys and to the processes that are common practice today in welding shops. 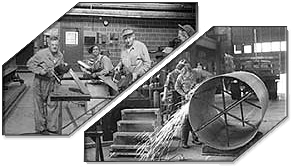 Today, customer growth and requirements has led to our current primary focus, fabrication. The fabrication of exotic materials remains our house specialty. The expertise and master craftsmen employed at Ramsay Welding are the best in the field. With the new addition of a HAAS VF-11 CNC Machining Center with X Y Z axis of 120" x 40" x 32" it expands our milling capability that was previously limited to 60".